The moon is in vogue. Well, she’s never not in vogue, but it’s safe to say that 2018 is her year. We’re collectively turning our gaze towards the cosmos, fixing our eyes on the moon and her cycles. March started with a full moon on the 1st of the month, and on the 31st we have another full moon — a Blue Moon. March 31st’s Blue Moon in Libra is asking us to find balance, part the curtains, and step fully into our power. The full moon is the energetic climax of the month and the moon’s 28-day cycle. It’s a time of intense intuition and psychic energy, and the following full moon ritual embraces that. On March 20th, we welcomed the first day of spring on the vernal equinox. We also moved into a new astrological year, entering the fiery and fierce sign of Aries, the ram. This second full moon of the month is the perfect opportunity to quiet the mind, tune into ourselves, and see what needs to bloom as we move into the new season ahead. What better archetype to work with than the High Priestess, the second card in the tarot deck? The High Priestess is innately connected to intuition, our magick, the divine feminine, cycles of death and rebirth, and spiritual mysteries. If you want to sow some seeds of magick this Full Blue Moon and spring, read on for a simple full moon ritual that will get you in tune with mind, body, and spirit. All inspired by the one and only High Priestess. A ritual to connect you to your intuition and magick. During this ritual, you’ll be breathing, moving, meditating, and connecting to your body. Before you begin, make sure that your roommates or pets won’t interrupt you. Set the mood; burn some incense, play some music (Bjork would be perfect), put your phone on airplane mode, and then start to breathe. 1Take a ritual bath or shower to cleanse. "I cleanse myself of what no longer serves me, I call in all the magick meant for me." You can also write your own mantra, keeping in mind your intention and what you want to manifest or banish on this full moon. Spend some time in the bath, breathing and feeling into your body. At least 10 minutes would be great, but step out whenever you feel ready. If you used loose herbs in the bath, wait until the next when they’ve dried to clean them. 2Cleanse with sacred smoke and set up your altar. Once you’ve chilled out in the bath, it’s time to really cleanse yourself and your space. Burning mugwort, sage, or palo santo, move the sacred smoke up and down your body, making sure to get your palms, feet, the crown of head, and the genital region. Move the sacred smoke through your space as well, cleansing your altar, any corners (where energy gets stagnant), and the rest of your space. If you can’t burn herbs, you can use a spray with the herbs’ essential oils or simply sprinkle salt in the corners of the room to absorb energy and clear your space. Now it’s time to set up your altar. This should ideally be where you can burn the candles without having to move them once you’ve lit them. You can use a desk, bedside table, a dresser, or another flat surface. 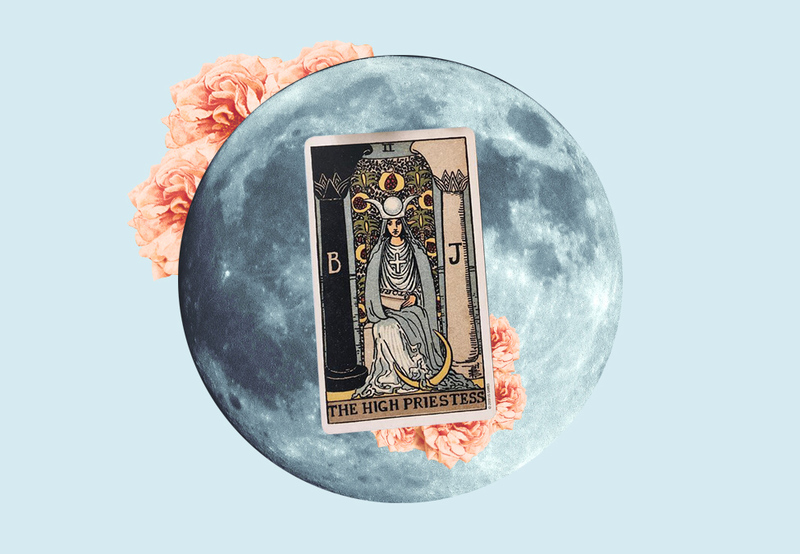 Place the High Priestess card on your altar, with your gold and silver candles behind her, one to each upper corner of the card (or wherever else feels “right” for you!). You can also add in any talismans, crystals, tokens, chalices, or whatever else you feel like honors the energies of this card. After your altar is set up, and you’ve cleansed yourself and your space, it’s time to get back into your body so you can feel your magick. Start in a seated, cross-legged position with eyes closed. If you need to, lean back against a wall or other hard surface. Start to breathe in through your nose and out through your mouth. Feel the earth supporting you. You can imagine a white, healing light from the core of the earth moving up through your spine to your heart. Now imagine a white, healing light from the cosmos moving through the crown of your head, down through your spine and meeting the other beam of light in your heart. Breathe into this light, feeling it warm you. Imagine it as a cocoon of healing and love that expands into a sphere around you, enveloping you and your altar. If you work with any guides, angels, or deities, you can call on them for assistance. 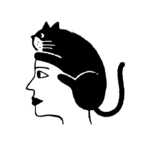 You can also do the same with your ancestors or with the High Priestess directly. Imagine a door opening at the crown of your head, allowing any intuitive or psychic messages to find their way to you. 4Call your magick in and light the candles. Once you feel back in your body, open your eyes and grab your pen and paper (or grimoire, if you use one). The full moon is a time of completion, and also a day when any magick is supported. You are about to talk to the High Priestess and ask her for something. Do you want to release a habit or something that’s no longer serving you? Or do you want to call something in? Think of this and then write your petition, or plea, on your paper or grimoire. Start with “I call in” or “I banish,” being clear about what you want. Now, move to your altar and light the candles. Continue to breathe as you cast your gaze on the High Priestess. Notice any messages that are coming to you. Notice any feelings, tastes, smells, or psychic impressions. Then read your petition to the High Priestess, and place the folded-up paper in front of her (if not in your grimoire). Now comes the fun. It’s time to embody your magick! This will look different for everyone, but you want to raise energy in a way that connects you to the archetype of the High Priestess, as well as to your intention. A few suggestions: dance to your favorite song, eyes closed, leading with different parts of your body. Paint, draw, sculpt, or color. Dress up in your most regal High Priestess gear and then take photos of yourself; collage over them using Photoshop or Powerpoint. Do your makeup inspired by the card, take a selfie, and write about what the High Priestess means to you. Create an altar to the High Priestess, to magick or your intuition. Lie on the floor, breathe in and out through your mouth as you make crazy sounds. and move your body, finding embodiment of soul and mind, and reconnecting to your physical magick. 6Let the candles burn, send off the energy, and close the ritual. Once you feel like you’ve raised the energy, return to a seated and cross-legged position. Imagine your intention moving through the beam of light connecting the crown of your head to the cosmos. Feel what it would feel like for your intention to manifest. Imagine the beam from your head moving back into the cosmos, and the one from below moving back into the earth. Imagine the door at the crown of your head closing. Press your forehead into the earth and imagine any excess energy returning to the ground. Let the candles burn all the way if you can. If not, use a snuffer or a fan to blow them out, relighting them each day until they burn all the way. If there’s excess wax, dispose of this at a local intersection in a garbage can. Thank the High Priestess, and keep her altar up as long as you feel called (and until the candles have burned). Return to your body and breath whenever you need to reconnect with her. Spend the rest of your full moon relaxing with loved ones, or by simply enjoying your own presence. And of course, never forget — you are magick!